Under min forskningsprocess har jag genom samarbetet med olika cirkusvetare blivit ställd inför frågan om cirkusens historia börjar med manegen eller med cirkusartisterna? Och vidare är cirkusen en ”form” eller är det människorna i ”formen” som skapar konsten? Jag gick så långt i frågan att jag ett tag hävdade att det inte finns någon nycirkus då det vi kallar nycirkus snarare är en återgång till den brokiga bakgrund som cirkusen kommer ifrån. Även om det kan ligga en viss sanning i det är nycirkusen i högsta grad en etablerad konstform idag med högskolor och stödjande samhällsstrukturer i ett stort antal länder. Nycirkusens och den nutida cirkusens historia, som började i kölvattnet av 1968 och det politiska klimat som rådde då, är på många sätt en historia om en konstform som har sitt tidiga ursprung tillsammans med de andra scenkonsterna, men som har gått en helt annan och egen väg. Många menar att cirkusen skapades 1768 av den brittiska hästuppfödaren Philip Astley. Han presenterade avancerade riduppvisningar i en cirkelformad manege, och för att fylla ut pauserna mellan häst numrena tog han in artister som jonglörer, akrobater och lindansare. Andra, som tex Tomi Purovaara och Pascal Jacobs menar att det är artisten och konsterna som är grunden till den cirkus vi ser idag och att vi kan följa cirkusens historia till det djupaste av scenkonstens historia, från gladiatorspelen, de gycklarsällskap som reste runt till Europas medeltida städer och kopplingar ända till Dionysiosfesterna i antikens Grekland eller Carnevalerna. I boken"Contemporary Circus - Introduction to the development of circus art", av Tomi Purovaara (som du kan läsa mer av på förlagets Stuts hemsida) skriver Tomi: ”Allt kommer från artisten, cirkusens utgångspunkt är individens fysiska konst.” Ser man det så är den traditionella tältcirkusen som vi förknippar så starkt med cirkus bara är en liten (om än viktig) del av cirkushistorian där konstformen har fångats i en form. Jag har under projektets gång gjort min egen tolkning av nycirkusens historia men inser mina begränsningar i att få till den som en sammanhängande och läsbar text… Det svider lite då jag själv tycker att jag har en massa bra och viktig information och analys att sprida som komplement till det som finns skrivet, men allt har sin tid och plats haha och även om jag är ett barn av nycirkusens allt är möjligt-tänk är jag varken historiker eller teatervetare i dess rätta bemärkelse! Jag lämnar därför med varm hand över Tomi Purovaara text till den som är intresserad av närma sig den nutida cirkushistorien och i litteraturlistan finns fler tips på läsning. Over the centuries an enormous, and in many countries still quite unmapped, area has formed around the different forms of circus. The newest title for the art form is contemporary circus, but it would be thoughtless (and disrespectful to history) to cut out all the previous achievements and reasons that have led to the circus art of our own time. I will try in this book to describe as diversely as possible one of the most easily approachable of all the art forms. This will not be a complete presentation, because the material that sprawls before a curious researcher is so abundant. The ease, or almost carelessness, with which traditional circus performances have been watched doesn't do justice to its magnificent history and reality, but is rather an image of the decay which beset the development of circus at a certain stage. Circus has been regarded in many countries up until the present day as marginal, low-brow culture in comparison to theatre, dance and music. Only contemporary circus has changed the situation, and it couldn't have done it alone because the backdrop was a wider change in the way that art and culture is understood. The content and objectives of circus have, especially since new circus began, tried to become more closely attached to the art field. On the other hand, since the 1970s, circus has become more accepted alongside other forms of popular culture – the wheels of circus have been both pushed and pulled into the moving, expanding art field! 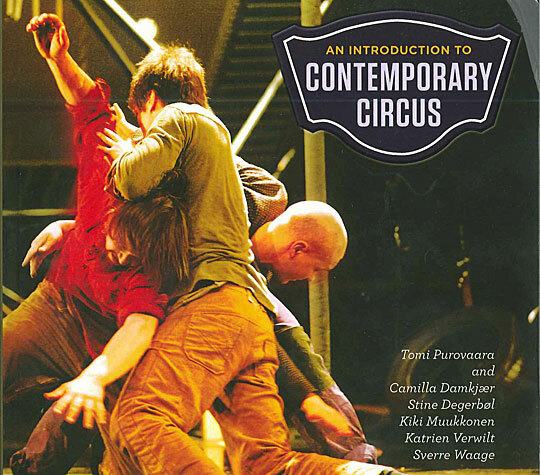 This book speaks about the value, phenomena and (still unknown) future of circus. I listen and look at circus from near and far. A lot of hidden information has already disappeared – a large part of the stories about the circus are self-produced myths and legends. I portray circus as a phenomenon, and highlight facts about individuals, groups and circus forms that I feel are important with regards to the whole. I don't want to become a chronicler; it is more interesting to try to demonstrate the general reasons that have directed the development of circus. We all have our own understanding of circus. It is easy to receive, and we see it as a picture of our own hopes, desires and fears. Circus feels familiar and nostalgic because we often have our first experience of it in childhood – when we have experienced the magic of circus either in a tent or on TV. In recent years I have defined circus as a form of performing art in which the instrument of artistic expression is the body's precise movement, which is based on circus technique, and is combined with objects or instruments from a circus discipline. In the context of society's political and cultural structures, the circus artist works in a relationship with the history of circus and other arts, the performance space, and the spectators. The definition is quite open, but I have felt that it is sufficiently flexible to describe the uncountable different manifestations in circus of our times. Everything comes from the performer – the starting point of circus art is the individual's physical art. We watch this individual's victorious battle; the opponents are the physical characteristics of the human body, mental weaknesses (fear, uncertainty), gravity, air resistance, the unpredictability of wild animals, the prevailing codes of conduct – and society's ideas of the value of entertainment and art. The circus artist's relationship with his body must be trusting; objectives are achieved through artistry and power, not magic and fate. The opportunity for spectacular glory is just as real as the danger of injury or death. Nor should circus's powerful dynamic of extremes be forgotten: the journey from the fear created by the acrobats to the comical clumsiness of the clown is often breathtaking.i The starting point of the circus is therefore a human being, and their need and ability to test the boundaries of their physical expression. Where do these uncountable different forms of circus come from, and why has that physical supremacy had to be hidden behind all sorts of disguises? Perhaps the question has been all about the fight to survive. Physical skills are still today often regarded as inferior to intellectual abilities. Maybe that is why circus has adopted different forms throughout history depending on what is possible and supportable at any given time. A circus performer has earned his income through the artistry of his body and (sometimes opportunistically) his adaptability.